Corn recipe is perfect for the Fall season. Combine butter, brown sugar, and light corn syrup in a 2-quart saucepan. Cook on medium heat until mixture has melted. 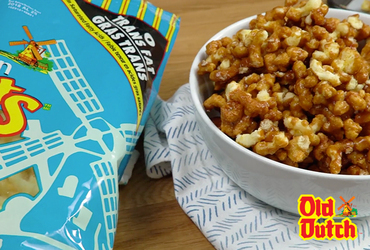 Place the Old Dutch Popcorn Twists In a large roaster pan and pour caramel mixture over the Popcorn Twists and stir until mixed. Place in oven for 45 minutes, stirring at least every 10-15 minutes. Remove from oven, pour on wax paper and break apart. Let cool and ENJOY!